The Heinkel He 46 was a German World War II-era monoplane designed in 1931 for the close reconnaissance and army co-operation roles. While it served with the Luftwaffe's front-line units only briefly at the start of World War II, the He 46 served as late as 1943 as a nighttime nuisance bomber and with the Hungarian Air Force. During the early 1930s, the German military was beginning to build up in strength. The RLM (German Air Ministry) wanted aircraft that could be rapidly built and would be able to swell the Luftwaffe's inventory with large numbers of aircraft for training. Ernst Heinkel designed many of these early aircraft. The He 46, for instance was, created to fill the short-range reconnaissance and army co-operation role for the Luftwaffe. 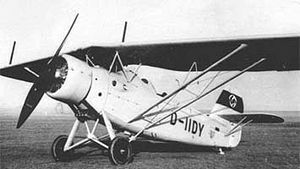 As designed in 1931, the He 46 was a two-seat sesquiplane of mixed construction. The upper wing was swept back 10�, and the tailplane was mounted high and braced by struts. The undercarriage was fixed, and the tail was fitted with a skid rather than a wheel. The He 46 prototype first flew in late 1931; its flight characteristics were good, but design improvements were incorporated. The small lower wing was removed, while the mainplane was increased in area by 22% and braced to the fuselage, transforming the He 46 into a parasol-wing monoplane. A more powerful engine was added to the second prototype, and a single 7.92 mm (.312 in) MG 15 machine gun for the rear seat was added to the third prototype. In 1933, production started on the He 46. The first production version, the He 46C-1, featured the improvements added to the prototypes, plus it could carry either a camera or 200 kg (441lb) of bombs. By 1934, about 500 He 46s had been built, and, by 1936, the Luftwaffe's aerial reconnaissance wings were all equipped with the He 46. In September 1938, 20 He 46C-1s were given to the Spanish Nationalists for use in the Spanish Civil War. By the spring of 1938, the Luftwaffe started to gradually replace the He 46 with the Henschel Hs 126, and by the time of the Invasion of Poland in 1939, only two units were still equipped with the He 46. By the time Germany invaded France in 1940, all He 46 aircraft had been withdrawn from operational service, although they did continue service in training units. The Hungarians, with He 46s supplied by Germany, took the He 46 to war against the Soviet Union in 1941 as part of Operation Barbarossa, during which the planes served up to 1943. The Germans took the He 46 back to war in 1943, when aircraft were taken from training units and used for night-bombing harassment missions over the Soviet Union. He 46a : First prototype. He 46b : Second prototype. He 46c : Third prototype. He 46C-1 : Initial production version. He 46C-2 : Export version of the He 46C-1 for Bulgaria, fitted with an NACA engine cowlings. 18 aircraft built. He 46D-0 : Six pre-production aircraft. He 46F-1 : Unarmed observer training aircraft. He 46F-2 : Unarmed observer training aircraft. Data from Kay & Smith, p. 120. 1 x� 7.92 mm (0.312 in) MG 15 machine gun for rear seat. Kay, A.L. and Smith, J.R. German Aircraft of World War II. Naval Institute Press, 2002. Heinkel He 46 Pictures and Heinkel He 46 for Sale.